Six candidates of Hmong descent are advancing to the general election next month in Maplewood and Minneapolis, Minnesota, United States. If they win, they'll join Senator Foung Hawj, bringing the total number of Hmong-American legislators to seven. Minnesota is home to about 66,000 Hmong-Amercian residents, which is a little over one percent of the state population. It was 16 years ago that Senator Mee Moua became the first Hmong-American legislator in the nation, followed months later by Representative Cy Thao. Although the American Hmong community is still underrepresented in mainstream politics, the rise of Hmong-American political participation corresponds with the overall success and progress of the community. Minnesota is poised to elect the largest number of Hmong-American lawmakers in state history. Six candidates of Hmong descent are seeking office at the Capitol next month — and there's a good chance most of them will win. The youngest, Samantha Vang, is 24. She's running for an open seat in a district that covers Brooklyn Center and a slice of Brooklyn Park. Even though she didn't win the DFL endorsement in the primary, Vang said, she edged out her opponent, Cindy Yang, by trying to engage potential voters who don't traditionally head to the polls. Most residents in House District 40B are people of color, but they've never had a person of color representing them at the Capitol, Vang said. "I think it's really important that we have someone who is intentional about including other communities who haven't been involved in the process," said Vang, who faces off with Republican candidate Robert Marvin in the general election. "That's why I decided to run." On a recent afternoon of door-knocking, one voter, Mee Thao, a woman in her 80s, conversed with Vang in Hmong. Within minutes, Thao pledged to vote for her in November. As a young millennial, Vang said, she's able to instantly connect with someone like Thao. "It feels like home," she said. "You know that she's just like your grandma, that we have a lot of shared experiences. How she grew up is probably how my parents grew up and how they came to the U.S."
Vang was born and raised in north Minneapolis and became the first in her family to graduate from college. Her parents came to this country as refugees from Thailand. Many people in Brooklyn Center have immigrant stories like hers. About 16 percent of the district is Asian-American, and most of them are of Hmong descent. Yet many politicians, including some in her DFL party, haven't always taken the Asian-American vote seriously, Vang said. "We are swing voters, and we are one of the fastest-growing communities in the nation," she said. "I think that we deserve more than to be tokenized. We should have a say in politics." Four other Democrats of Hmong descent are advancing to the general election next month in DFL-leaning districts in St. Paul, Maplewood and Minneapolis. If they win, they'll join Sen. Foung Hawj, bringing the total number of Hmong-American legislators to six. A seventh Hmong contender, Republican Yele-Mis Yang, is challenging DFL Rep. Jamie Becker-Finn. In north Minneapolis, Rep. Fue Lee delivered an election upset two years ago when he defeated a 10-term legislator, Joe Mullery, in the DFL primary. Like Vang, Lee didn't have the backing of powerful endorsements. "When I was out there door-knocking, oftentimes people said, 'We really like you. You have some great ideas, but we still think it's not your time yet,' " Lee said. "And I don't think that that's a message that we should be sending to anyone here in the state of Minnesota and across the country who has a passion to serve." Lee, who's now 27, kept going. He said he made inroads with young voters who, as he did, graduated from Patrick Henry High School, or with the parents of children who were enrolled in English language learning. Today, Lee said, immigrant communities and people of color are even more fired up now that immigration is being used as a campaign issue. Another DFL legislative candidate, Kaohly Her, policy director for St. Paul Mayor Melvin Carter, is running for an open seat against Republican Patrick Griffin. At 45, Her said she's nearly an "elder" to the other Hmong-American candidates, but she said her younger counterparts are teaching her about the importance of claiming a seat at the table. "We've been here for 40 years," said Her, who said her family was part of the first wave of Hmong refugees in the United States. "We've been waiting in line, waiting for people to anoint us to tell us it's our time. The younger generation is not waiting. They're going to take this turn now." Although this year marks a record number of Hmong-Americans running for the Legislature, neither Fue Lee nor Samantha Vang is a newcomer to politics. They cut their teeth years ago behind the scenes, organizing local campaigns. Minnesota is home to about 66,000 Hmong residents, which is a little over 1 percent of the state population. And their political victories at various levels of governing are hardly novel. It was 16 years ago that Sen. Mee Moua became the first Hmong legislator in the nation, followed months later by Rep. Cy Thao. Looking back, Thao chuckles when he recalls the pressure he felt at the Capitol. "I almost felt like I had to represent the Asian race," he said. 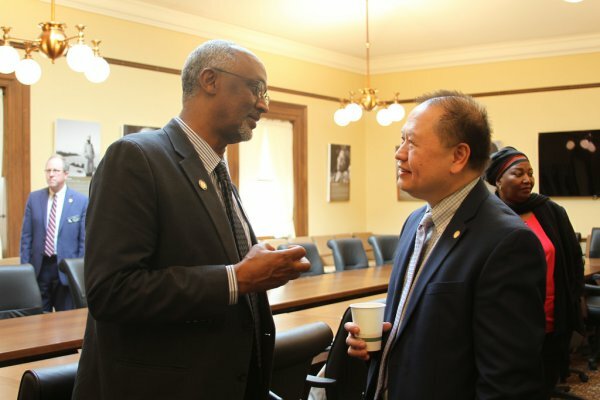 Now retired from political life and splitting his time between Florida and Minnesota, Thao said he feels hopeful for this new crop of Hmong-American candidates. "At the Capitol, it's all about putting your coalition together," he said. "If they're able to put aside their egos and work with each other, I think they could really do some incredible work — for not just the Hmong community but for the immigrant community and communities of color." Both Thao and Sen. Moua decided to step down at the same time, in 2010, leaving a void at the Legislature. Even though they helped pave the way, Thao said he hopes this next generation of Hmong-American lawmakers will be able to accomplish even more. The rise of Hmong-American political activism corresponds with the overall progress of the community over its more than 40 years in Minnesota, said Vang, the candidate from Brooklyn Center. "We've been successful as business owners, as doctors, lawyers, as being a really core component of the community," she said. "Yet we're still behind in mainstream politics, so I think that's where the hunger is."